Not a day has gone by that Ewan McTavish, the Viscount Sethwick, hasn't dreamed of the beauty he danced with two years ago. He's determined to win her heart and make her his own. Heiress Yvette Stapleton is certain of one thing; marriage is risky and, therefore, to be avoided. At first, she doesn't recognize the dangerously handsome man who rescues her from assailants on London's docks, but Lord Sethwick's passionate kisses soon have her reconsidering her cynical views on matrimony. On a mission to stop a War Office traitor, Ewan draws Yvette into deadly international intrigue. To protect her, he exploits Scottish law, declaring her his lawful wife--without benefit of a ceremony. Yvette is furious upon discovering the irregular marriage is legally binding, though she never said, "I do." Will Ewan's manipulation cost him her newfound love? Peeking at the nobleman from beneath her lashes, Yvette reached to straighten her bonnet. It hung askew off the side of her head, like a giant drooping peony. She shoved it back into place but the moment she removed her hand, it flopped over once more. The stranger's unrestrained laughter filled the carriage. “Oh, bother it all.” Yvette's patience with both her rescuer and the silly bonnet were at an end. She had no choice but to remove the dratted thing to reaffix it. Several strands of hair tumbled to her shoulders when she removed the cap from her head. Suppressing a shriek of annoyance, she placed the hat beside her. She then set about securing the wayward curls. Pinning the last strand in place, her eyes met those of her companion. She stilled, as did the world around her. The air hung suspended in her lungs. Her eyes widened in disbelief, her stunned gaze riveted on his face. “You exist?” Her voice was husky with awe. A voice, deep and dark, caressed Yvette's heightened senses. She stared. Her gaze roved across his handsome features returning, as if compelled by some unseen force, to his eyes. Those eyes. Fringed by thick lashes, the mesmerizing turquoise pools gazing back at her sent her senses reeling in recognition. Her mouth dropped open. No, it couldn't be. “Am I dreaming?” Giving a quick shake of her head, she lowered her eyelids for a moment. Lud, but she was befuddled. "Who are you? 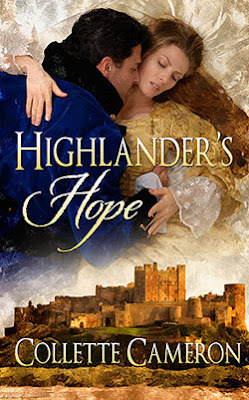 Buy Highlander's Hope on Amazon.com.